If you are in Kyoto during the month of July you have the opportunity to experience one of Japan’s most famous festivals. Believed to have its origins over 1,100 years ago when floats were made and paraded in the town to appease the deity of plague and illnesses, the Gion Matsuri (festival) takes place over the entire month of July with many different events, with the highlight of the festival being the grand procession of floats (Yamaboko Junko) that takes place on July 17th and 24th. For a good visual review of the festival, watch the above video from Discover Nippon … or under Video Options, check out the 360 degree video for a cool virtual reality experience of the parade. The Gion Matsuri, familiarly known as ‘Gion-san,’ is a festival of the Yasaka-jinja Shrine with the highlight being the pageant of some 20 and 10 floats called yamaboko proceeding along the main streets of Kyoto on July 17th, known as the Preceding Festival (Saki Matsuri), and on July 24th, known as the Latter Festival (Ato Matsuri). 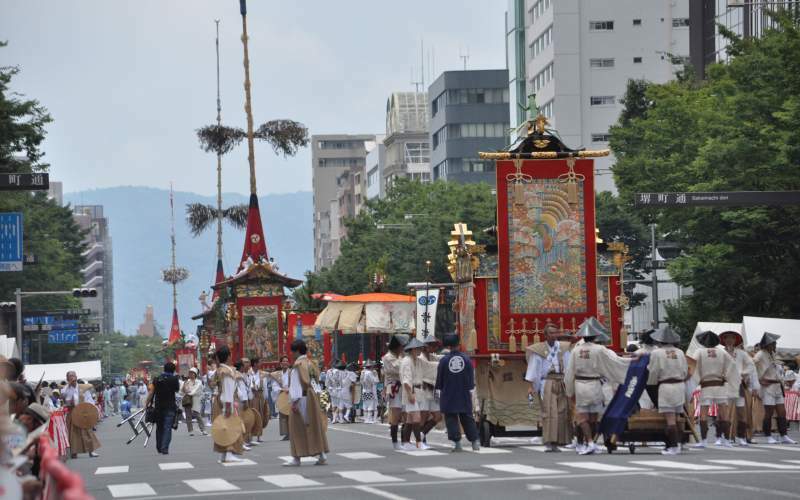 The parade has two-types of floats called Yama and Hoko, with the Hoko type usually about 25 meters tall and topped with a long pole shaped like a spear. The festival is said to have its origins as part of a purification ritual to appease the gods thought to cause fire, floods and earthquakes. In 869, the people were suffering from plague and pestilence which was attributed to the rampaging deity Gozu Tennō. The Emperor Seiwa ordered that the people pray to the god of the Yasaka Shrine and sixty-six halberds (a two-handed pole weapon), one for each province in old Japan, were erected at Shinsen-en garden along with the portable shrines (mikoshi) from Yasaka Shrine. This practice was repeated wherever an outbreak occurred and in 970, it was decreed an annual event. 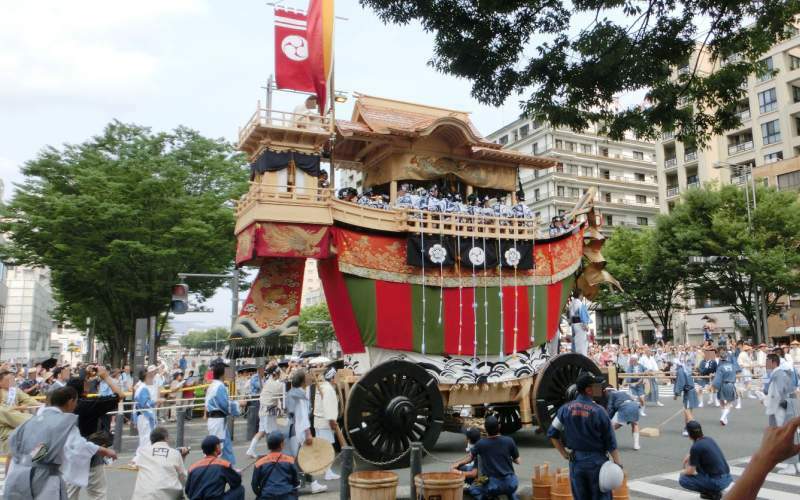 Over time the increasingly powerful and influential merchant class made the festival more elaborate and, by the Edo period (1603–1868), used the parade to brandish their wealth. 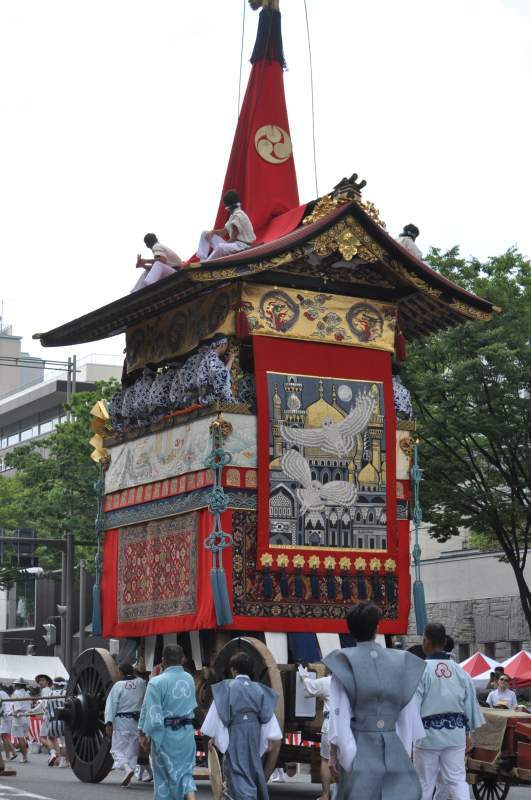 In 1533, the Ashikaga shogunate halted all religious events, but the people protested, stating that they could do without the rituals, but not the procession. This marks the progression into the festival’s current form.